I have a new toy to play with. 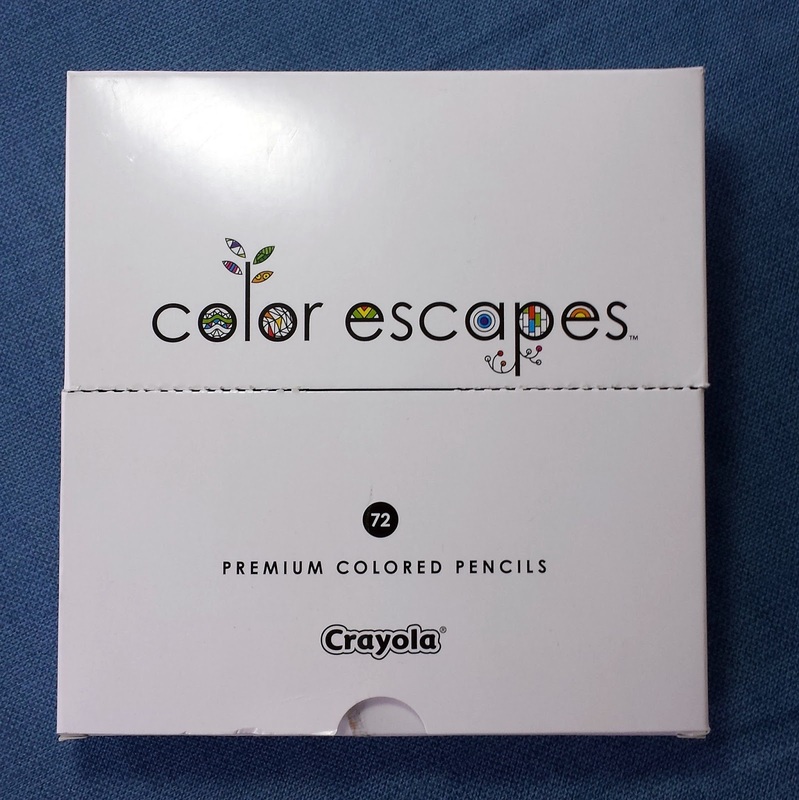 I blindly ordered the brand new Color Escapes premium colored pencils from Crayola. I know what you are thinking, "Crayola, that's for kids!" Well, these are definitely a step above the usual school supplies. I used them on the tile above so I could really see what they could do. I'm pretty happy with what I got and how the pencils preformed. 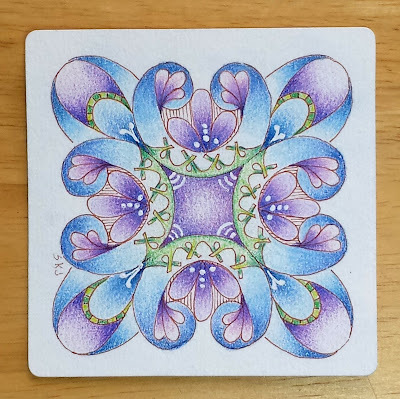 When I did this tile I started by laying down the lightest color in each section coloring the entire area, I applied the color with a VERY light touch, I then laid the next lightest color - again - with a very light touch. I moved down the range of colors, adding each darker value in a slightly smaller area than I did the last one. At the end I went back with my lightest color and blended the color all together - it isn't until this point that I applied the color heavily and effectively burnished the area. At the very end I added a few white details with a white gel pen. 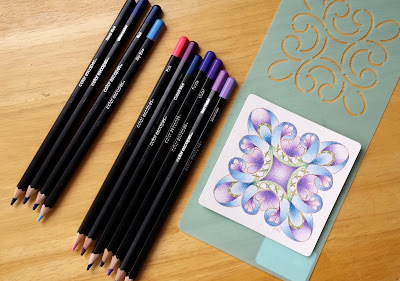 How did this process work as opposed to my Prismacolors? Well, they didn't lay down as nicely and the blending was more challenging. But it wasn't that much harder. I have no idea what the lightfast ratings are for these pencils - there is nothing written on the box or on the pencils. Did these sharpen well? Yes, I had no problem there - but I'll let you know at a later date what happens when I get further down the pencil. This picture shows you the range of colors I was using in my purple sections and my blue sections. Did the color choices give me exactly what I wanted - no. But I could 'make it work'. It helps if you have a little knowledge of color theory when you have to substitute colors. 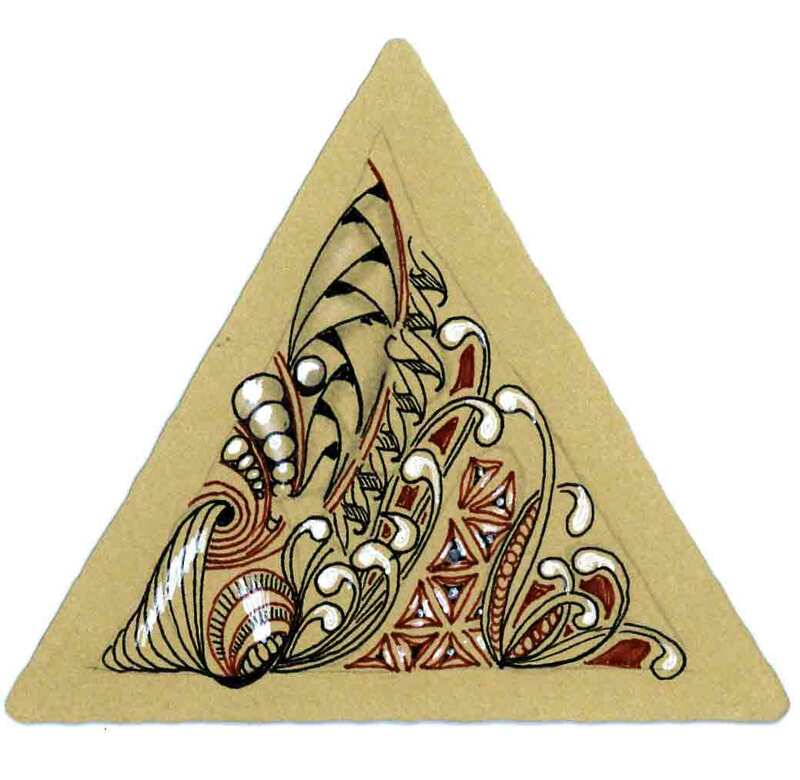 Also in this picture you can see the stencil I used to get my Zendala shape. If you are a quilter you will recognize that it comes from quilting supplies. I used a pencil very lightly to get my basic lines in. I then used my trusty, Micron, brown pen for the lines. This is what the box looks like. I haven't seen it in the stores yet - I got mine from the Crayola.com web site. Thanks for the review, Sue. Thank you so much for this write up. 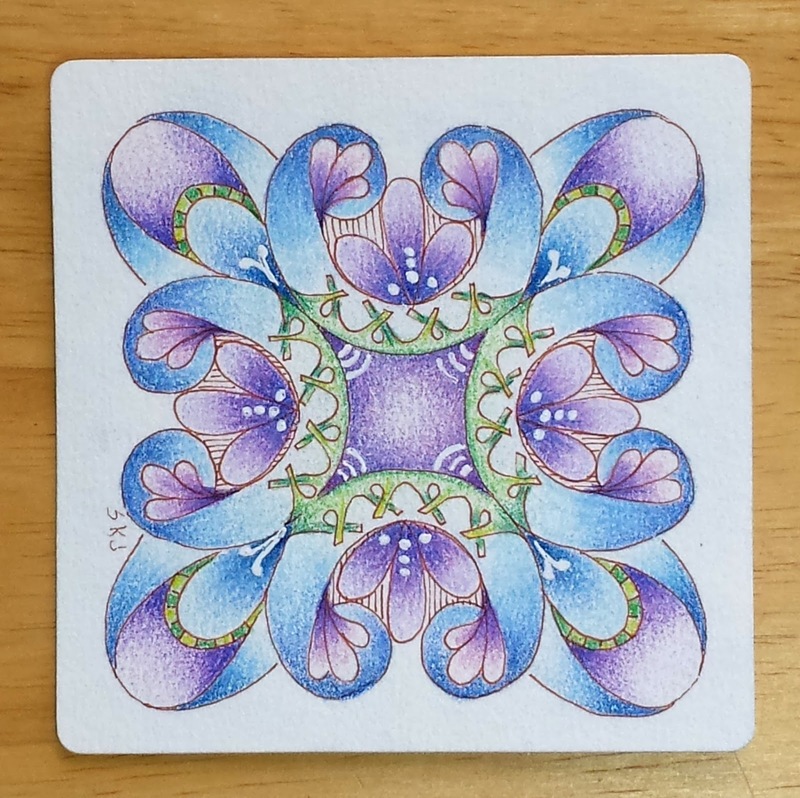 Very pretty tile and colors! Thanks for the great review! Was looking at those and sure appreciate you review of them. Thanks.